The ether is a universal medium, which fills all space. It appears to be “dynamic” relative to an earth moving thousands of miles per hour through space. The ether is normally electrically neutral, ultra-fine, and penetrates all solid matter. There is also an ultra high frequency, ubiquitous radiation, normally in equilibrium, called Zero Point Radiation (“ZPR”), which interpenetrates the ether, and represents electromagnetic radiation in its finest, densest form, which, in conjunction with the ether, conserves universal perpetual motion. The ether in conjunction with the ZPR, is the source of all matter and force. “Energy” does not exist in physical form, but is “the ability to do work”, which is equal to “force over time”. The word “energy” is a convenient fiction, like “time”, which is an arbitrary measurement of the rate of motion of matter through ether-filled space. All events occur in the present, and the “past” and “future” are merely metaphors. Electromagnetic disturbances in the ether extract “energy” from the ZPR, which is explainable only by an ether theory. This “free energy”, which is virtually unlimited, is universally at work, created by the perpetual motion of matter, and the perpetual exchange of stronger and weaker forces, through which the equilibrium of the universe is maintained, the sum total of all processes equaling zero. Since all solid matter is continually hurling through space, always in motion, it is always subjected to the “etheric wind” and ZPR interactions. These effects are not perceived except during changes in the orientation of mass or its velocity. All mass and space have dielectric properties. Differences in dielectric properties cause changes in the electromagnetic displacement within mass and the etheric wind. Earth’s electric field creates dielectric displacement effects within ether and mass within earth’s electric field. The difference between the dielectric displacement within a mass and the dielectric displacement outside the mass in the etheric wind, creates a down-force in the direction of the negative polarity, as the etheric wind ‘blows’ through a mass. This is called “gravity”. Since all mass is in motion, all mass has momentum, even when apparently “at rest” relative to earth. Momentum is a body’s resistance to change in its state of motion. Since inertia is also the resistance of a body to changes in its momentum, inertia and momentum are due to the same thing, the resistance of electromagnetic micro helical tubules to changes in velocity (and relative “pitch”), direction, and lateral motions or orientation. Since all space and mass is composed only of “electric content”, momentum/inertia is electromagnetic in nature, and can be electromagnetically synthesized. All mass contains electrostatic charges, which when “carried around” in the ether/ZPR-filled space by celestial or ‘local’ movement, constitute currents. These currents actually flow between mass and the ether, and are integral to the mechanism by which momentum is imparted to mass in motion. The currents create magnetic fields as their equal-and-opposite counterparts, and give a rotatory motion to combined, bi-directional electric and magnetic fields and currents, around irrotational vacuous ether cores. This rotatory electromagnetic action creates momentum, as the force-free “screw-type” reaction within mass, creating its motion relative to the ether cores, from which the mechanical force is transferred to the atomic mass with which the electromagnetism is associated. Since these phenomena are electromagnetic in nature, they are synthesized by recreation of the electromagnetic conditions which a body would exhibit due to a particular kinetic state. Just as electromagnetic waves of low frequency can penetrate a body, waves of higher frequencies—above LR. and below U.V.—can cause the ether to “assert its inertia resistance”. The technology involves high voltage D.C. ‘brush’ currents, high frequency currents, rapidly varying electrostatic forces, and light/heat beams. The rapidly varying electrostatic forces “rarify” (stretch) the ether carriers, as the light/heat beams polarize the medium in the desired direction, as the D.C. brush currents induce the exchange of carriers, creating a vacuum in that direction, inducing motion. At the opposite end of the ship, high frequency currents draw the carriers through the ship, and creates a compression of the ether, as it penetrates the solid mass and synthesizes the rotatory micro helical tubules, which whirl around the ether cores along the polar axis, at a pitch corresponding to a particular rate of momentum. Since the strength of the electromagnetic interaction is 1040 time greater than the gravitational interaction, that much more work can theoretically be done in the same time, using the same “energy”. Since “seeing is believing”, and I have seen, I believe. The behavior of man-made flying saucers proves the existence of these “free energy” inventions of Nikola Tesla, which show that he was right in his opposition to Relativism, and that the prevalent theories taught in the scientific institutions of the world are patently fraudulent. Consistent with the idea that “dynamite comes in small packages”, this small book, along with my prior book, Space Aliens From the Pentagon, initiates the rediscovery, reconstruction and publication of Nikola Tesla’s Dynamic Theory of Gravity and related electropulsion technology, the greatest invention of mankind. The Secret Government—a fraudulently concealed, unconstitutional, corporate-state entity—has heretofore controlled electropulsion technology by concealing it and other advanced free energy technology, on behalf of international, coercive, corporate-state monopolists. Electropulsive ships are concealed through “special effects”, and “stealth technology” (also based on Nikola Tesla’s inventions)—as they fly and hover in the sky, and by “psycho-political” means—the dissemination of false “alien” and “extraterrestrial origin” propaganda— through “UFOlogy” groups led by covert government agents. While official government spokesmen deny the existence of flying saucers, covert government agents, posing as “skeptics”, “UFOlogists”, and “paranormalists”, engage the public’s attention in a phony debate. The “skeptics” ridicule the UFOlogists and paranormalists, lumping them together with rational witnesses, as if “...to see a flying saucer” is as ridiculous as “...to see a ghost or alien”. This phony debate based on false logic fits nicely into the overall cover-up system, designed to conceal “advanced human technology”, not “alien” technology. The grip of this secret socio-economic dictatorship, depends on coercively extorted income, by forcing us to buy archaic fuel and power- which funds their control of our communications, political and monetary decisions, enforcement of unjust laws, regulations, and procedures expanding its powers, while limiting or excluding our individual human rights, and denying our access to information, materials, and technology which is ours because we paid for it with our taxes. Our access to the truth is necessary for our independence and survival as a free people. Despite the confusion, concealment, BIG LIES, and judicial and socio-economic abuse by the corporate state, we can resurrect the TRUTH, determine the correct technology, circumvent obstructions, and use our creative ingenuity to build these ships for ourselves, to free our society from the Secret Fascist Corpocracy. What better way to end a book on “Occult Ether Physics”, than with a chapter on another concealed “free energy” process, which appears to extract energy from the ether—using similar techniques on the same substance that makes Tesla’s electro-propulsion possible? In SPACE ALIENS, I specified a free energy process in which helium is made to produce 460,000 calories/gram-atom, by simple spark discharge, which is based on data from numerous generally available texts and scientific encyclopedias. This is the highest energy output I know of from a noble gas, and the same gas can be used ad infinitum, the only input energy being that required for spark discharges. Since helium is inappropriate for the average “Joe”, and since the output is probably more than you could handle, I will more appropriately show you how to perform another free energy process, using that most easily accessible gas, hydrogen. I will also give you the explanation for the heat produced in so-called “cold fusion”, and a few other free energy processes, all closely related to the atomic hydrogen process and occult ether physics. Over the years, the “Relativistic Quantum Mechanics” (hence, “RQMs”) concealed every process or reaction which could show the invalidity of their theories, “...in the interest of national security”. Their false theories actually became one of the most important means by which, from the standpoint of the government’s secret agencies, that “national secrets” were concealed, while at the same time, from the standpoint of the controlling corporate fascists, all ‘dangerously efficient’ technology which would destroy their iron grip on us, could be concealed. According to deceitful relativist quantum mechanics, all energy coming out of a reaction, must go into the reaction, only from a “non-ether” source recognized by them, and only in the discrete “quanta” permitted by their misapplication of Max Planck’s earlier quantum theory. The basic idea of Planck’s original quantum mechanical theory, was that energy levels of atoms must change in whole number integers (1,2,3, etc. ), called “quanta”, which are based on the basic charge of a single electron, which assumes only certain assigned energy levels in different atoms and molecules, and is used to define the magnitude of all of the smallest, intermediate, and largest possible energy changes of atoms and molecules. All atomic energy changes must conform to the permissible whole number equivalents or multiples of these quanta. Accordingly, energy absorbed by an atom must fit this stringent criterion. Despite what I consider to be obvious attempts to conceal basic physical data conflicting with this principle—as misinterpreted by the Relativists and incorporated into their theory, as if it were exclusively their theory and not that published earlier by Planck—the process I am about to discuss with you has glaring inconsistencies in it, even as described and mis-measured by the Relativists. It is said by them that the process of dissociating diatomic hydrogen molecules into separate atoms as atomic hydrogen, requires the absorption of 109,000 cal./gram molecule (“1.9 k.cal./gram molecule”). Yet, in taking the basic hydrogen atom and considering all its discrete ‘quanta’—whether in the atomic or molecular state—it appears to me that there is no state of the hydrogen atom or molecule in which such energy could be “stored”, even when using the RQMs’ theories, especially in view of their irrational statement that the energy is still possessed by the molecule after it has already been released! It is their contention that an independent hydrogen atom can only exist as such because it has absorbed an abnormally large amount of heat, despite the fact that by their own criteria the atom has no mechanism, identifiable by them by which it could do so. When two such hydrogen atoms come together with the presence of sufficient initiation energy, the great amount of heat said by the Relativists to be stored in the hydrogen atom is liberated. The RQMs never directly measured the amount of dissociation energy necessary to bring the hydrogen atom from the diatomic to the atomic state, because they didn’t know how to do so, but because their theory said that “all reactions are reversible”, they said the dissociation energy was the same as the energy released on recombination of hydrogen atoms. Then to make matters worse, they defined the atomic hydrogen (ground) state as if it were an excited state, and the molecular state as if it were the ground state. Realistically, the atomic hydrogen reaction can only be satisfactorily explained by reference to, construction of, or re-construction of, an ether theory. While it may be arguable that the “binding energy” between the two atoms of the molecule somehow ‘includes’ this energy in some undefined and mysterious way, this argument actually supports an ether theory, because the binding energy must somehow be exchanged with the energy which is released when the molecule forms, consistent with the equal and opposite reaction rule. Otherwise, one is expected to believe a kind of backwards Orwellian doublethink kind of thing that the RQMs have perpetrated, since “...everything is like relative, man.” This kind of latitude is permitted only for them, while those who disagree are held to a higher standard. The doublethink features of Relativism stem from the fact that Albert Einstein was a Kaballist-Existentialist—and an Illuminist—whose epistemology was a Platonist one. In philosophy, there are two basic epistemologies—theories of the origin, nature and limits of human knowledge—representing the two basic categories into which the epistemologies of all philosophies must fall, and which are supposed to explain how one knows something according to a particular philosophy...by what means they know it...if in fact, they do “know” it. Since he who asserts something has the burden of proving it, rather than one who disbelieves it, the means by which it is purportedly known, may come into question. No one is legally, morally, or ‘spiritually’ obligated to believe anything, without reason, or a valid means of knowing it to be “true”. All epistemologies are classified as either Platonist, or Aristotelian. The “Platonist Epistemology” is so named because of the theory illustrated by the cave analogy, in the ancient Greek Philosopher, Plato’s book, The Republic. In Plato’s cave analogy, an observer inside a cave, facing the inner wall at night, sees only the shadows cast upon the wall by such things as a passing caravan, projected by a fire burning beyond a road along which a caravan is passing. According to Plato, man cannot know reality, but sees only a ‘shadow’ of reality, because there is a ‘higher world’ of ‘perfect forms’, which exist only ‘in heaven’. It therefore becomes obvious how this epistemology follows religious thinking, and that many religions have been influenced by it as somehow adding ‘scientific credence’ to their religious ideas, which are based on faith rather than reason. The same reasoning has been used by scientific, philosophical, economic, political, and ‘spiritual’ con-artists for centuries, and every totalitarian philosophy ever known has relied upon this fallacious ‘reasoning’ which is identical to the Platonist epistemology. One wonders how the viewer in Plato’s cave would draw the line between ‘knowing’ a shadow, and a “shadow of a shadow”, since a shadow might also have a ‘higher form’, under this theory. The “Aristotelian Epistemology” in the meanwhile—based on the ancient Greek philosopher Aristotle’s theory—holds that the senses are valid, scientific tools of cognition, which we can rely upon, to detect the facts of perceivable reality, and that we can, by relying upon the facts so perceived, know reality and determine other, perhaps unperceivable facts of reality. As can be seen from a comparison of these two epistemologies and their implications, the philosophies and endeavors based on the Platonist Epistemology are mystical flaky, and/or totalitarian, while the philosophies and endeavors relying on the Aristotelian Epistemology are more rational and objective, especially when applied to the natural sciences. It can also be seen that the use of a Platonist Epistemology by a physicist should be considered unforgivable, while Einstein’s theory, built upon this fatally flawed epistemology, has been popularized by the communication monopoly controlled by the power-elite, because it makes a potentially inquisitive and questioning society dumber and easier to control. Einstein’s image is continually built up as if that of an ultimate and infallible creature who should be regarded as a ‘god’. This propaganda not only protects the false theory, but also aids in concealment of valid theory and advanced technology which would end the reign of a world-wide power structure of corporate-statists, who think society already has all the technology it ‘needs’, else the elite’s ‘grip’ on the world, held in place by their archaic technology which exploits mineral, industrial, and banking interests owned by them, might be torn loose. I would have very little quarrel with a quantum theory of atomic energy levels, were it extended to include an ether theory, as it should have been logically construed, but I take issue with its present development, limitation, and misapplication by the RQMs. My position is that they already have applied it to an ether theory, that this application is well concealed, and that this book is needed to begin the reconstruction of these concealed truths, for use by the public. While Planck said his quantum theory applied to a “system”, he didn’t say the Relativist’s “system”—which came into existence after his theory—was the only system it could be applied to. Since a rationally extended quantum mechanical theory would not exclude an ether, my “RQM” label distinguishes between the relativistic misinterpreters of quantum mechanics, and what could be called the “Integrated Reality Mechanics” (“IRMs”). The atomic hydrogen reaction first came to my attention in 1964, when I was studying industrial processes at Sam Houston State University, in Huntsville, Texas, the year after taking an introductory course in college physics. While reviewing various welding processes in a textbook, my eyes fixed on an older process called “atomic hydrogen welding”. By that time, the process was already considered “obsolete”. To me, the process seemed valuable, not only because it produces such high temperatures—above 3400° F.—enough to melt tungsten—the highest temperatures producible by man—but is also “self-shielding”, and can be used to weld diverse metals, often without flux, with a concentrated flame producing little heat distortion, when welding thin metal. In the process, ‘normal’ diatomic H2 is shot through an electric arc which dissociates it into “atomic” hydrogen, H1. This atomic hydrogen recombines at the (welded) metal surface, producing the very high heat Though the process interested me then, and always has, I have never seen an atomic hydrogen welding unit for sale, for the 31 years hence. Industry’s obvious excuse for laying the valuable process aside was that it had been ‘replaced’ by ‘better’ processes, such as Heliarc, TIG, and MIG welding, though they rarely mention “plasma arc welding”, which has also almost disappeared from the market. Since plasma arc welding is merely an extension of the atomic hydrogen process, using a specially redesigned torch, the ‘mysterious’ reasons are undoubtedly the same. The process simmered in the inner recesses of my mind for a few years until 1976, when I rekindled my interest in the process for possible use in welding stainless steel and reducing and fusing platinum metal compounds, because hydrogen reduces such compounds (which must also be shielded from oxygen) to metals. The atomic hydrogen process does not rely upon the combustion of hydrogen with oxygen in the air, but upon the “atomic” energy released when atomic hydrogen recombines to form the ‘normal’, diatomic hydrogen. I still had some unanswered questions, since the various welding data at my disposal failed to mention sufficient specific details. If Nikola Tesla was right, then I am right, that the energy comes from the ether. Because I knew of no source from which to purchase an atomic hydrogen torch, I decided to build one, but my information was inadequate for proper construction. In the torch I made, the hydrogen gas entered the arc concentrically, around both electrodes, instead of passing through the arc at a right angle. I also used the wrong kind of arc transformer, so it didn’t work as well as it should have. “... The atomic hydrogen formed is chemically very active. Atomic hydrogen is formed when an electric arc between tungsten electrodes is allowed to burn in hydrogen at atmospheric pressures (Fig 106)”. 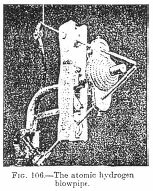 I was surprised to find this in the Van Nostrand encyclopedia, but I also found that in 1910, the D. Van Nostrand Company published a book by Haller and Cunningham, entitled The High Frequency Coil, (The construction of a Tesla Coil for the advanced amateur. 119 pages), so there is a record of sorts, of Van Nostrand’s association with Tesla. It seemed odd to me that it was later suggested that the 103 calories of dissociation energy absorbed from a very brief exposure to the arc is the same heat as that “...required for welding” as described, and I believed it to be more reasonable that the excess heat had to come from “elsewhere”. The dissociation energy would be analogical to a slice of bread (@4 cal. gram), and the gross output would be equivalent to 60 loaves of bread (@1814 cal. lb. ), calorie-wise. There was too much disparity between the two, with plenty of suspicious omissions and confusions, in an obvious attempt to cover up the truth in between. The older text showed the clearer construction of a device, and the newer text showed that only 103 cal./gram mole were required for dissociation, while the older text showed that 100,000 cal./gram mole were liberated on recombination. Only by jumping back and forth between the two sources was I able to put a complete documentation together, and discover the conflicts. It was apparent from the newer text, that the writers intended for us to believe that the final 100 k.cal./gram molecule heat—later upped to 109 k.cal/gram molecule—was absorbed from the arc, but the 103 cal./gram molecule dissociation heat figure showed a net 108,897 cal./gram molecule unexplained. If there are about 65 cubic centimeters per mole of hydrogen at its critical volume, it seemed highly unlikely that sufficient energy to weld could be absorbed from the ‘dissociating arc’, during the time required for 65 cubic centimeters of gas to pass from the orifice and through the arc. 109,000 cal./gram mole equals 432.6 BTU/gram mole— roughly the heat energy contained in 60 loaves of bread—the “extra heat energy” which they have asked us to believe is ‘stored’ in an amount of atomic hydrogen which weighs l/28th of an ounce, during its brief passage through the arc! attempts, brought on by the national security laws and the firmer establishment of the RQMs, to conceal certain scientific knowledge which had been discovered all the way back in 1912 by Langmuir. Aside from the discrepancies between older measurements, regarding the comparable outputs between the combustion of gasoline and the combustion of molecular hydrogen, and the output from the atomic hydrogen process, to the newer text, there was a failure, so far as I could determine, to state under appropriate references (or any others I could find), some important facts concerning atomic hydrogen, and even misrepresentations of the actual comparative outputs of gasoline and hydrogen combustion, through gobbledegook—the “badge of fraud”—of which I spoke in Space Aliens. Norton apparently was forced by circumstances to rely on some ‘scientists’ who represented the fossil fuel cartels and other conflicting interests, while the older text was relatively free of such influences. For example, in the newer text, at page 1311, energy from the combustion of hydrogen was stated at 29,000 calories per gram ( 52,200 BTU/lb). In the older text, this value was given at 62,100 BTU per pound of hydrogen, with a comparative value for gasoline (“petroleum”) at 19,800 BTU per pound (stretched to 20,825 BTU per pound in the newer encyclopedia). These figures roughly comported with those in the encyclopedia for n-Heptane (“gasoline”) at 19,314 BTU/lb, and hydrogen at 51,571.4 BTU/lb, which are more or less repeated at page 1137, with n-Heptane at 10,737.2 cal./gram, and Hydrogen at 28,669.6 cal./gram, yet nowhere in the newer text was the total output from atomic hydrogen given that I could find, and nowhere in the newer or older texts was it affirmatively stated that the hydrogen was not “consumed” in the process. The corrected figure (52,200 BTU/lb) shows, in a comparison between the combustion of “normal hydrogen” (to form H2O or water) and gasoline (to form CO2), that hydrogen has a yield of roughly 2.7 times that of gasoline, by weight. Then we come to a comparison between gasoline and atomic hydrogen. Though the two can be compared BTUfor-BTU and pound-for-pound, showing atomic hydrogen’s phenomenal output, the real measure of the atomic hydrogen process is gleaned only from a comparison between the “input energy”—103 cal./gram molecule-~and the net output. In the atomic hydrogen process, hydrogen is not really a “fuel”, but rather a “medium” used in the extraction of and conversion of energy from the ether, by transforming invisible radiation and electrical energy into infrared (heat) radiation. The energy required to pump the recombined hydrogen to a holding tank, before being recycled and shot back across the arc and into the reaction chamber once again, is not considered in this computation. This energy should be negligible, since the dissociation energy is barely more than a thousandth of the gross output, and there is probably a way to make the process work without a pump anyway. The manipulators of information have both lied and made the direct comparison between atomic hydrogen and gasoline as difficult as possible, but I have waded through a multi-step mathematical, physical, chemical and unitary process to get to the truth. Atomic hydrogen produces over 109 k.cal./gram molecule, which is 109,000 k.cal./kilo. Minus the 103 cal./gram mole endothermic dissociation energy, and a net of 108,897 k.cal./kilo is left. A kilo equals 2.205 lbs., so a pound equals 453.51 grams. You must divide the net cal./kilo by lb./kilo to get cal./lb., then multiply this times °F/°C (1.8) to get °F/lb. This is then divided by grams/lb. to get 196,015 BTU/lb. The gross is 196.200 btu/lb. In comparison to 19,314 BTU/lb for n-Heptane, atomic hydrogen has 10.5 times the energy per pound (of H1 per gal. of H2O). There is an easier mathematical process, but this shows more clearly what I did. No wonder the process “went out of use”. With this process, a home consumer would pay nothing for fuel, because he could produce a small amount of hydrogen in his basement, any time he needed it, and could use it over and over, ad infinitum. He could heat his house, drive his car, and use it for “home-industrial”, uses. In a motor cruiser on the ocean, one would never have to worry about where the “next gallon” of fuel was coming from, or what it would “cost”, because like sunshine, the heat from atomic hydrogen is “free”, except, unlike sunshine, you could produce as much as you want, any time, day or night, summer or winter, rain or shine; the farmer would no longer be dependent upon the oil cartels for his energy, and could run his machinery and heat his barns “free”. He could tell the fuel suppliers and the banks to screw themselves. People in the far Alaskan north could heat large spaces without huge expense. “Northern industry” would thrive again. The population control Nazis will hate me. It is obvious that the reason corporations like ARCO went so heavily into producing solar energy equipment in the early ‘70s, was so they could control and ultimately raise the cost of (free) solar energy, to make it “competitive” with gasoline and other fossil fuels. There are many ways used in contemporary texts to confuse facts, but the most effective way is by complete omission. Such facts could not have been concealed by “accident” or mere “oversight”, because they are too phenomenal. Only by plowing through a tortuous mathematical process and confusing units and other factors was the true motive for such concealment revealed for certain, but tell me why I’m not surprised? Conservatively speaking, the atomic hydrogen process bears a 10.5-to-1 ratio to n-Heptane. Would you care for 315 miles per gallon? How about 550,000 miles? It all depends on how many times you recycle it. The figures for n-Heptane are grossly confusing, as one might expect, since it is shown only by comparison by weight that hydrogen combustion has a 2.7-to-l ratio to n-Heptane. This deception was effected by playing around with differing heat and weight units, pressures, and volumes, and the difference between the centigrade and Fahrenheit scales. The “109,000 cal./gram molecule” figure for atomic hydrogen was omitted from the newer text, though one might have been able to extrapolate it from some complex data stated in other areas where the inquisitive person is not expected to look. There was a total absence in the new text or other “new” data available to me, of a direct comparison of energy outputs between combustion of petroleum and hydrogen, much less the atomic hydrogen process. Another stupid trick used is to compare “system weights”, under the false assumption that the user of hydrogen would have to use only the systems they present, raising the “comparable” weight of hydrogen to gasoline, using cumbersome cryogenic bottles or hydride storage tanks, etc., when the simple figures clearly show that one-third the amount by weight of hydrogen would be needed for a comparable combustion process. Note that the atomic hydrogen process does not involve a “consumption” of the hydrogen, yet even if it did, the ratio between atomic hydrogen and gasoline is still 10.5-to-one. Take into consideration also that all the best methods for obtaining over a hundred miles per gallon (even hundreds of miles per gallon) of gasoline in automobile engines, utilize the vaporization of gasoline and mixture of it with air prior to combustion, something which is easier to do with hydrogen, because it is in a gaseous state at normal temperatures and pressures. Also consider that while n-Heptane is a ‘purer’ gasoline, it hasn’t been available for years, and most “gasoline” is a dilute mixture with water and various additives, with only about 50% n-Heptane, so I’m being as kind as I can be to “gasoline”. If a pound of gasoline could propel a car 30 miles, the consumption would be 666.6 BTU/mile. On the same scale, a pound of atomic hydrogen would yield 315 miles. Then you could repeat it, over and over and over. A pound of hydrogen could conceivably supply all your energy needs for your whole life, and you could produce another 100 pounds of it electrolytically, right in your basement, from tap water! Is this free energy, or what?! Notice that the “at rest” state of the molecules, is couched in language that makes you think that the “infinitely separated” atomic hydrogen atoms represents the “excited state” for the element. In layman’s terms, the RQMs simply made the statement that the dissociation and recombination energies had to be the same, because their theories depended upon them being the same. Then they measured the dissociation energy backwards, by measuring the recombination energy, and stating the measurement as if it were the dissociation energy. This clearly misrepresents, by a Ph.D. in physics of the “Royal Society”, that hydrogen in the “atomic state” is not in a ground state, but in an excited state. In this 1965 physical chemistry text from England, the heat energy generated on recombination of the hydrogen atom is given as 109,000 cal./gram mole, then misrepresented as the “potential energy” of the “ground state hydrogen molecules” which have just formed! But the “ground state” of hydrogen is the atomic state, with the electron at its lowest level of energy, so the RQMs are hoist by their own petards, since there is no way the ground state atoms could “store” the 109,000 cal./gram molecule. Where, exactly would this energy “reside”? Concurrently, this same figure is falsely equated with the heat generated exothermally when two hydrogen atoms—each in its “excited state”—come together to form a molecule. Since the heat energy is released on recombination, the molecules lack the potential energy already released. The potential energy of the separate atoms in their ground states, is greater than that of the molecules, because the heat energy is released from the entrained ether and converted ZPR—not from the hydrogen atoms—when they combine to form molecules. This is hereby unmasked as Orwellian doublethink. Since when is the potential energy of the atom of an element measured from its molecular state? This is exactly like saying that a truck sitting at the bottom of a hill has more “potential energy” than one sitting at the top, because of the energy required to drive it up to the top of the hill! What a strange way to define “potential energy”. It is like saying an empty gas can has the potential energy of the gas that it takes to fill it up! The unique thing about the hydrogen atom, is that it is “born” at the top of the hill! Its astounding properties lie in its ability to perform as a “doorway” between the ether and the world of more familiar atomic matter. The relativist statements have been unwittingly accepted as correct, because there is no ether or Zero Point Radiation possible under their theories, and the molecules have to have more energy than the atoms separately, because “E = MC2”. The RQMs have misrepresented and concealed this process in which separate atoms—with lower MASS—possess more “atomic” energy than the molecules! Ha! These facts on hydrogen show that E equals MUCH MORE THAN MC2. Under relativism and quantum mechanics, “solid” matter is thought erroneously to be the most “compact”, “stored” form of “atomic energy”, because the energy is supposed to be released by the “smashing” and destruction, or fusing together of atoms, which Tesla said was false. It is clearly shown by the atomic hydrogen reaction that Tesla was right and the relativists and Einstein were wrong, because the hydrogen atoms have more potential energy in a separate atomic state than they do in the diatomic molecular state! This can only be either because when separate, the atoms “gather” energy from the ZPR, and eject it from the ether when recombined! In either case, the energy is not stored by the atoms, and no longer possessed by the molecules after release, unless there is an even greater lie hiding in the relativist bushes. This perverse potential energy fallacy is also a way to confuse the diatomic hydrogen molecules with the nascent atomic hydrogen atoms produced by the hydrolysis of water. The energy of hydrolysis is equated with the energy of dissociation, and the energy of combustion with the energy of recombination, yet the information presented here shows that by combining the hydrolysis of water, in which atomic hydrogen is produced directly, with the atomic hydrogen recombination process, instead of the combustion process—and perhaps throwing the oxygen away—that at least 10.5 times as much energy as the hydrolytic input can be produced, in still a third astounding hydrogen free energy process. This is true because the atomic hydrogen process without question releases at least 3.75 times the BTUs by weight, as ordinary hydrogen does in the combustion process. Even the relativists agree that the “energy of combustion” equals at least the “energy of hydrolysis” (even though it is well known that the industrial production of hydrogen by electrolysis is generally 120% efficient). Production of atomic hydrogen directly by hydrolysis, which cuts out a separate dissociation operation, is yet another exciting possibility. It does not expend the electrical equivalent of 109,000 cal./gram molecule (to produce only 65 cubic centimeters of hydrogen gas). As a “welding process”, this process was ‘obsolesced’ by MIG and TIG welding, neither of which can compare to its welding efficiency and uses. Since the welding process was its only “public” use in the years past, the “new” processes allowed industry to toss the “obsolete” process onto the junk heap (except for their own ‘secret’ use of it). The “new” processes were promoted by U-Know-Who, motivating their welding suppliers and the electric power companies at their own levels. More archaic tanks, transformers, gauges, torches, electrodes, gases, fluxes, and electric power, etc., etc., to be sold at a hefty profit. If people generate their own hydrogen for welding at home, how much equipment, supplies and power will they buy? How does the atomic hydrogen obtain its energy, if not from the “ether”? No wonder establishment science doesn’t want you to know there is an ether. If we are to believe the “law of conservation of energy”, as interpreted by establishment (relativistic, ether-excluding) ‘science’, this process is impossible, yet using data available from ‘standard’ texts, I have shown that the input energy of 103 cal./gram molecule is somehow either ‘magnified’ to 109,000 cal./gram molecule of hydrogen—a multiplication of over 1,058 times—or that, by use of hydrogen as a “medium”, that the 103 calories is ‘seed’ energy (called the “activation energy”), triggering the atomic hydrogen’s apprehension of a net 108,897 cal./gram molecule, from the “ether”. An equally phenomenal “atomic helium” process (reported in Space Aliens) is 4.6 times this output. It can be conducted the same way, and produces the same kind of electrical energy and radiation-to-heat energy transformation, in which “mass” is only a “medium” used in the process. The same principles are shared by the Atomic Hydrogen Process, by Josef Papp’s Method and Means of Converting Atomic Energy into Utilizable Kinetic Energy (Patent No. 3,670,494, of June 20, 1972), and several other discoveries mentioned here. If these processes used as much electrical energy as they produced, and electrical energy was the end product sought, what would be the use of the processes, right? At the comparable 30 mpg for n-Heptane, helium could produce 42.86 times as much, or about 1285.8 miles per pound. According to Van Nostrand’s Scientific Encyclopedia, 5th ed., Van Nostrand Reinhold Co. (1976), simple electron bombardment of helium gas, in a special chamber, excites the helium atom to a temporarily radioactive isotope of extremely short half-life. In this state, the helium atom unpairs its electrons, promotes one electron to the 2s state (in which state it remains for only a very short time), and afterward releases 460,000 cal/gram-atom (per gram of helium), on collapse of the excited atom back to its ground state. The heat is in the form of photons. This is similar to the process for atomic hydrogen, as illustrated by my drawing shown on page 102. It is my theory that while the electron clouds are in the excited (expanded) state, they gather and convert energy from the ZPR. Apparently, as the hydrogen passes through the arc, the electric and magnetic fields, plus heat, provide the activation energy triggering the molecule’s ‘apprehension’ of an additional 108,897 cal./gram molecule of endothermic dissociation energy. Just exactly could this be possible? Since each hydrogen atom is composed of a proton and an electron (each with a pair of purportedly equal and opposite charges) one would expect the binding force between the molecules to be very weak, but when the atoms are separated they purportedly expand greatly in size—because negative ions are larger than the non-metal atoms from which they are formed—encompassing a greater volume of Omni Matter (my term for the “ether”). On recombination, the atoms shrink in volume, as the excess ‘gathered’ energy is squeezed out of the ether as free (heat) energy. The “endothermic” dissociation absorbs only 103 cal/gram molecule, yet on recombination, the atoms “exothermically” yield a net 108,897 cal/gram molecule. How exactly does this occur? As stated in Space Aliens, it is my theory that all space is packed solid with bumper-to-bumper “Omni Particles” (A.K.A., “the ether”). This elusive yet dense and ultra fine, absolutely transparent matter, is meanwhile being omnidirectionally interpenetrated by something called Zero Point Radiation (“ZPR”), of such high frequency and voltage, that it is difficult to measure or comprehend. This radiation is in (nonrelativistic) equilibrium, therefore referred to as “Zero Point” radiation. The facts proven by the atomic hydrogen process, explained by the involvement of the Omni Matter and the ZPR, are forbidden by relativity and quantum mechanics, in which a simple harmonic oscillator cannot have a stationary state of zero kinetic energy, because the ground state still has one half quantum of energy and the appropriate motion, yet by relativity’s ‘other’ rules, the principles of kinetic energy has no applicability to electromagnetic radiation (the ZPR). Since relativity also rejects the existence of an ether, there is nothing in so-called “empty space” to contain such radiant energy, and the atomic hydrogen process would have to create its energy from “nothing”, therefore violating the law of conservation of energy, as misinterpreted by the relativists, who see all energy functions as part of the ‘winding down’ products of an “original” BIG BANG. You can forget what the relativists said. The equilibrium of the ZPR can be upset by disturbances created in the Omni Matter—which I divide into Omnions (ultra-fine, positive “subprotonic” particles) and Omnitrons (“sub-electronic” charges carried by the Omnions—all of which the ZPR interpenetrates. Unidirectional vibrations (disturbances) in the Omni Matter cause it to accumulate transferred force from the ZPR, throwing Omni Matter out of equilibrium, and restoring equilibrium to the ZPR. The Omni Matter’s excess force is then transferred through the atomic hydrogen atoms (or other temporarily excited, enlarged atoms encompassing it) into the atomic mass frequencies, during disturbance, thus restoring equilibrium to the Omni Matter. This transferred force is not “energy created from nothing”, but only represents a change in the “form” of some of the infinite energy (force overtime), already existing in ‘space’ in other forms (such as the ZPR, or as “sub-electronic” charges). Whenever H2 is dissociated to 2H (H1), and the single electron clouds enlarge to encompass more Omni Matter (affected by a greater ZPR), there is a reaction with and transfer of force from exothermic atomic sources, through the molecules, into stripped Omnions which were entrapped to bind the atoms together. This exothermic energy is sufficient to throw the Omnions within the electron clouds, and concentrated in the space between the atoms, beyond their electronic quantum boundaries, so that the additional energy needed to dissociate the atoms is regained from the surrounding Omni Matter and ZPR, restoring the equilibrium of the Omni Matter. With the recombination of the atomic hydrogen to form 2H, the converted ZPR radiant energy, and sub-electronic charges—which I call Omnitrons—is ejected (squeezed out) from the atoms, as heat or other interconverted radiant energy- of lower frequency, as the electron clouds shrink with the addition of positive charge carried by the Omnions. The reason the electron cloud density of the hydrogen molecule is more concentrated in the area around the space between the atoms, is because of the entrained Omnions’ presence there. Otherwise, the two negative charges carried by the two atoms would cause mutual repulsion. Actually, since heat is infrared-spectrum radiation, the process can be conceived as a means of converting the ZPR from an ultra-penetrating positive (‘cold’) spectrum radiation, to a mass-reactive infrared (heat) spectrum radiation, and that is the proximate “source” of the so-called “free energy”, in the form of exothermic heat radiation. The ZPR is an analog to sunshine, except it penetrates all matter all the time and is not affected by day or night, so it can be converted to usable energy all the time with the appropriate technology, such as the atomic hydrogen process. Incidentally, this same atomic hydrogen process, as first published here and now, is also the apparent source of the anomalous exothermic heat produced in aqueous cavitation, as well as in the so-called “cold fusion” process, which are two other free energy processes which are based on the atomic hydrogen process. In addition, it is the phenomenon which was apparently responsible for the cavitation-based, powerful fuelless pumping action produced by the “Hydro Vacuo Motor” of John Ernst Worrell Keely, in c. 1870.. The atomic hydrogen atoms have single, unpaired electrons in enlarged shells. These atoms are in Mendeleev’s Group I-a, and all the atoms in that group have unpaired outer electrons, and are photoreactive to and transmute when exposed to ultraviolet light, as do all the atoms of elements below atomic number 19. Some of these elements transmute in visible and infrared light, and all of them can be used to transmute ZPR into usable free energy. This photo-reactivity creates temporary, artificial-radioactivity-producing isotopes of short half-life, with the emission of photon energy restoring equilibrium to the atoms as they return to their ground states. The energy for these radioactive emissions comes from the ether, not from the atoms themselves. The atoms can be analogized by certain crystals, described by the Raman Effect, in which light passing through the crystals is “stepped down” to lower frequencies. The infrared spectrum light produced by the atomic hydrogen process is thermically reactive with normal atomic and molecular matter, because of its longer wavelengths. The transfer of force from the ZPR, via the Omni Matter, through the dissociated H, atoms, is apparently the kind of thing somewhat cryptically spoken of by Tesla, when he stated: “There is no energy in matter other than that received from the environment.”4 In so-called “cold fusion”, the electrolytic cell produces “nascent hydrogen”, just like in the atomic hydrogen process, and the recombination of the monoatomic hydrogen to 2H releases heat, the product claimed. This atomic hydrogen process also proves Tesla’s theory that “atomic energy” comes from the environment, not from ‘smashing’ atoms. It proves that “mass” does not even enter into the equation, and that Einstein’s “E = MC2” is wrong. Einstein’s theory says this process as I describe it could only be possible if the hydrogen were ‘annihilated’, converting its “mass” into heat, and otherwise, is impossible. But the hydrogen is still hydrogen, before, during, and after the process, and Einstein was wrong, wrong, wrong! It defies relativism, Heisenberg’s “uncertainty” principle, misinterpreted quantum mechanics, and the BIG BANG! Perhaps this or a similar process was also what Leland Anderson referred to in his eulogy of Tesla, when he mentioned his “plucking” thermal units “...right out of the thin air”. After all, the hydrogen atoms when in the 2H molecular form are smaller, therefore “compressed”. Compression of a gas releases heat radiation, usually thought to originate with the energy endothermically absorbed during decompression, but in the case of hydrogen, the change is effected by the natural, physical process of recombination to 2H. The molecular atoms can be ‘decompressed’ by a slight application of heat of dissociation, because the strong binding force between the atoms created by the Omnions, is more easily weakened by a small amount of exothermic energy sufficient to separate the atoms, so that the Omnions regain their Omnitronic charges from the surrounding ether and ZPR. Hydrogen atoms have the highest charge-to-mass ratio known, a ratio which almost completely neutralizes the protons. ‘Decompression’ of the electron clouds occur during dissociation, because there is less positive mass within the clouds to pull the clouds down toward the protons. As the protons dissociate with application of the 103 cal/gram molecule, this allows the greatly expanded electron clouds of the atoms to encompass a larger volume or Omnions, carrying sub-electronic Omnitronic charges equal to 108,897 cal/gram molecule, from the only source available, the ZPR and Omni Matter (A.K.A., “ether”). Since there is no great cooling activity in the proximate area of dissociation, the ‘heat’ can only come from the Omni Matter and ZPR, and is ultimately a conversion of energy in the form of random, ‘cold’ ZPR, and Omnitronic charges, into a coherent, utilizable form of heat radiation. This process, though it can be thermally triggered, is not merely a thermal process, because the net energy released is not converted originally from thermal energy, but from ZPR and Omnitrons, into infrared (thermal) radiation. Amazingly, the raw data for this process came from ordinary science books, though the oldest text was produced in England, and would be practically unavailable to the average American experimenter. The full magnitude and output comparable to petroleum was only obviated by conversion of weights, measures, units and temperature scales, into a consistent picture, to obtain the total net outputs. Most physicist or chemists would refuse to believe the results, even if they had calculated them themselves, and would insist that they had erred. This is indeed an inverted BIG LIE, which is told very small, and often. The BIG LIE consists of a denial that there is an ether, the distortion of quantum mechanics, and the exaggeration and minimalization of other incompatible measurements, to create a false overall picture. This is then backed up by a vacuum of information, in publicly available texts and other sources, created via the National Security Act, by the Fuel/Power Cartels. Now that we are beginning to understand our atomic-hydrogen, free energy system, and the great magnitude of its output, what are its most appropriate and immediately applicable uses? The most direct, appropriate use of this technology appears to be to provide heat for homes, as well as for home-industrial heating purposes, such as in agriculture. A secondary use would be to produce heat for steam to drive turbine-powered electric generators, or for motive power for cars, trucks, boats, trains and planes. This system would be excellent if coupled with a refrigerant-driven, closed-loop turbo-electric generator, to provide electric power for electro-propulsive flying saucers, the ultimate in private transportation. Since the net output is heat, the first order of business is a special heat exchanger, to transfer heat to water or other media, or to produce steam for turbine power. The heat in the reaction chamber of the atomic hydrogen furnace must be quickly removed by the exchanger to prevent a buildup of heat sufficient to melt the reactor surfaces which receive and catalyze the recombining gas atoms. The simplified design shown below is merely a proposal. Years ago, German metallurgists developed a hydrogen furnace which used a copper crucible in a closed system which created the “hydrogen environment” required for reduction of the platinum group compounds. To withstand the high temperatures required for the reductions, the copper crucible was cooled from below by water, which removed the heat fast enough to prevent melting of the copper, as platinum metals were melted in it with the torch from above. The following concerns a device which appears to unequivocally disproves Einstein’s relativity theories and proves Nikola Tesla’s nuclear theories. Based on material in Space Aliens (pgs. vii, 185 and 187), a researcher invited me to collaborate in a 50/50 development of a device (similar to that shown on page vii), with the provision that I not use his name. I suggested using an iron pipe and 15 kv transformer, based on Tesla’s use of an iron “antenna” in a Colorado Springs experiment. With an approx. .1 amp/120 volt input (12 watts), an output of 48 kw was achieved. Since the K-capture level of iron is 7,110 volts, I suggested tuning the two 7,500-volt legs to 7,110 with a variac (total voltage 14,220), at which the output jumped to 66 kw, a gain of over 38%. With 120 v/.l amps/60 cps/14.22 kv going into the ungrounded device, the output (on the same leads) is apparently superimposed at high frequency, so that, while maintaining the high voltage ‘excitation electric field’, the output can be extracted by high voltage high frequency filter and rectifier, thence reduced to usable electric power with an inverter. In “K-capture”, the innermost “K-orbit” electron of iron drops into the nucleus, converting a proton into an extra neutron. This appears to render the iron unstable (i.e., “radioactive” in the Tesla sense), so that it disturbs the equilibrium of and reacts with the ZPR, converting some of it into an electrical output, via the iron. This device has also been said to transmute zinc to mercury, when used in a different way to produce great heat. At this point in time the device is somewhat of an enigma, which appears to produce great energy. As the device runs it hums, with no arcing, as a cool shaft of air exits its top, with strong electric/magnetic fields about it. Some ozone appears to be forming. This was probably (part of) what Tesla meant when he said “I have a new use for iron”, and “...it is when things are quiet that something is really going on”. 196,200 BTUs is a lot of energy from a pound of hydrogen. I have to pinch myself. Then repeat it 10,000 times. When this kind of “atomic energy” hit a small segment of the unknowing American public—the welders—in the late ‘40s, there were newspaper stories saying that the trans-Atlantic voyages of the Queen Mary could be powered by a hunk of radioactive material the size of a golf ball. They told their exaggerated stories that way when they wanted us to get hooked and pay for it, but today’s “nuclear reactors” produce electricity at the same efficiency level as coal and gas-fired generators (38%), and we still have to deal with the inevitable problems of greater expense, entrenched, archaic, stagnant “nuclear” and fossil fuel technology, nuclear decay, waste, and probable devastation ala Cernobyl. The stumbling blocks to the use of hydrogen are actually illusions, created by the corporate-state coercive monopolists—CommuNazis (A.K.A., IllumiNazis). The atomic hydrogen process was discovered in 1912 by Langmuir, and was developed as a “welding process” in the ‘30s. The DOE ‘scientists’ at Los Alamos said the use of hydrogen involves heavy, cumbersome cryogenic tanks and equipment, until a liquid hydride system developed by Dr. Gerald Schafflander of California, was pointed out by me, in a letter to the New Mexican in 1980, totally ridiculing their phony efforts in 1979. Then Schafflander and associates were prosecuted by the SEC, because the liquid hydride stored hydrogen in something like “rock salt”—which cracked out at about 70° C.
DOE scientists mention only the heavier, more cumbersome, solid metallic hydride systems. Schafflander’s lighter liquid hydride system, which uses solar-voltaics to generate the hydrogen, would be a wonderful way to store and deliver hydrogen for the atomic hydrogen process. Goodbye, oil cartels, hello atomic hydrogen, it’s payback time! By the way, the reason my “cold fusion” process (using my weird, lead-based cathode) which I tested back in 1980, worked so well (see Space Aliens from the Pentagon 5, pg. 198), was because Langmuir, back in 1912, said a lead amalgam cathode produced “nascent (atomic) hydrogen”. Cold fusionists, throw away your palladium cathodes and get lead amalgam! Watch the price of water rise to $1.40 per gallon. After all, why should “they” allow “us” to buy a whole gallon of pure H2O “chemicals” for less, especially when a gallon is enough for a lifetime? William Lyne was born in Big Spring, Texas in 1938 and raised in west Texas oil boom towns, two years in the Bay Area of northern California during WW II, and the southeast Texas Big Thicket country. He has a B.S. in Fine Arts and Industrial Arts (1965) from Sam Houston State University, Huntsville, Texas, and an M.F.A. in Studio Arts (1969) from the University of Texas at Austin. He has been living in New Mexico for the past 27 years, and resides just to the south of Santa Fe, in the little railroad town of Lamy, with his 13-year-old son Angus.